Don’t limit yourself to a life lived solely within a comfort zone. Take risks. Welcome the challenge to overcome any obstacles to making a change in your life. Have you ever had that feeling that life is good, but it could be better? We become comfortable in our routine and we dare to step outside of that comfort zone. We may even feel stuck. The good news is, life is not set in stone and we have the power to do something about it and in doing so you’re making a choice and a commitment to make a change. With a sincere belief that the power to make a change is within you you can plot a path forward and make active decisions about your life. Now I want you to think about what kind of future would excite, move and inspire you? If you wish to have that future what are you prepared to change right now? If you’ve been to this place in the past, but you froze when you got to the part about making, ask yourself, “What is holding me back?” Maybe you get analysis paralysis and overanalyze to the extent that it all becomes too overwhelming. Or maybe you don’t know you have it within you to do it and before you know it all the negative self talk begins cycling in your mind and you put the whole idea out of your mind. So, whether your faced with the inevitable changes that happen in life or changes you’re choosing to make from a place of personal growth, embrace it. Take control and believe in the power that is within you to shape your thoughts, actions and future. Change has been the theme of my life this year. My daughter graduated from high school and will be moving out in August to attend Miami University. With choosing a school, prom, college orientation weekend, and our trip to Siesta Key, Florida our year has been a whirlwind. So much love and so many emotions wrapped up in it all. My son shared some very exciting news about possibly doing an engineering coop abroad. So proud and excited for him, but abroad is a big change from a 30-minute drive to come home. Chad and I have started talking house hunting to right-size. Moving out of a home that is full of so many family memories is tough to contemplate. We still have to come to an agreement on what we want. He wants tiny house or condo. I just want a smaller house. Whatever happens, it will be a change and an adventure for us both. Becoming a girl boss and growing a business has been a big leap of faith and an even bigger step outside of my comfort zone. My yoga and personal training business continues to grow and I’m loving it all, but the business side is still a steep learning curve. In addition to teaching yoga classes, I’ve started a Yoga 101 6-week workshop series that I’m teaching at local studios. I have plans in the works to add 1-day yoga/wellness retreats and fitness bootcamps to my calendar. I’m also working on expanding my business to more of an online presence and services. I can’t wait to roll it all out! Changes for Jill Conyers | Fitness, Health & Happiness are in the works to better capture the —purpose of this community. Many of you have commented on how I [and my blog] have evolved over the years. It’s an evolution that has and will continue to reflect who I have become and how I can help you. I’ve been experimenting with frequency of new content and social media platforms to make changes on the blog. 3 new posts a week just hasn’t been doable and honestly, I want to work spend less time at my computer. And, my newsletter is getting a makeover. For most of last year I backed off accepting sponsored content to, again, find a balance. I’m partnering with brands that I love (and you’re going to love too) to share new things that are meaningful to the purpose this community. I PROMISE YOU’RE GOING TO LOVE IT! Other changes? Yes, there’s more. Mindfulness, meditation and a morning ritual are all a part of my everyday life. Every. Single. Day. I’m making changes to find the right balance to continue to do the things that make me excited to get out of bed every single morning. The things that make my heart beat fast. One more thing. Something to keep in mind when you’re contemplating change. I remember someone saying to me, “you don’t have to change everything about yourself.” That statement stuck with me and lead to asking myself whether or not the changes I want to make are coming from a place of unworthiness and shame or from a place of self love, purpose and personal growth. At the time it was a little of both. Now I look at making a change through a reflective lens. Is the change I want to make what I truly want AND need? Or, is it coming from me not feeling good enough or unworthy as I am? Have you made a change in your life lately? What is one change you want to make that scares you a little (or a lot)? 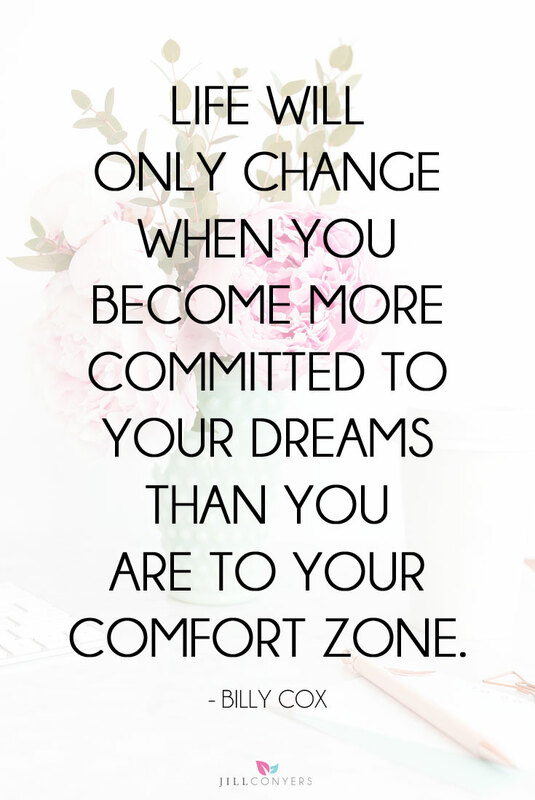 When was the last time you stepped outside of your comfort zone to make a change? Such a motivational post! Sometimes it takes a nudge to get us out of our comfort zone, but it is always well worth-it. It’s easy to talk ourselves out of trying something new or accepting a challenge– thanks for this reminder : ) LOVED all of the quotes. Quotes are great to help and motivate a person if they believe the quote. For the changes in your life, I know how you feel. After my daughter moved out I didn’t need a big house anymore. So I spent two years traveling and decided to move to Barcelona, Spain. Change happens if we want it to or not, so we should enjoy the new opportunities. Love these various quotes that you have here. I don’t know about being afriad of what could go wrong helps though. But focusing on the right does sound like a positiv.e. It keeps you moving in the right direction I think. Super inspiring and exactly what I needed right now. Thanks so much for sharing! I love the quotes that you added to your post! 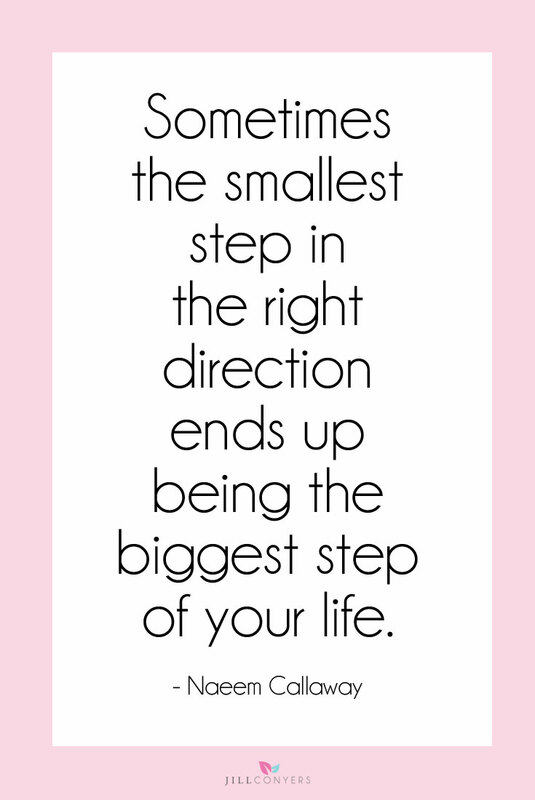 Sometimes taking the leap is the best thing that you can do! I love all these quotes, especially the Tony Robbins one… he gets me! Love a good quote. Tony Robbins has just so many that I love and live by!! Thanks for the positive start to Friday! I’ve always loved inspirational quotes and these are just wonderful! They are so awesome to read to get your day started. Thank you! These are great quotes for those hard-to-get-started days! Glad you enjoyed the quotes. Sometimes it’s so amazing to me how we can come across the exact words we need to hear at that exact moment. …needles to say, I had to pin some of those!! Thank you for pinning Ilka! Great quotes! The power that words have really is amazing! This is so inspiring Jill. I absolutely love it. Thanks for making it printable. Hi Natalie. I’m happy to share. Have a beautiful day! I’m so glad I found your site. I am looking forward to browsing through it with a cup of tea. I’m seeing a lot of content that resonates with me. Hi Amanda, nice to meet you. Welcome! If you like the content you will love the new and improved community newsletter. Good stuff straight to your inbox. Be on the look out for details to sign up. LOVE these! I’m always looking for new and inspiring quotes. Thanks for sharing these Jill! Thank you Emily. I’m happy to share! I love these! My oldest has been big into quotes and loved a few of these too! I love the Tony Robbins’ quote. We saw him live in March, and he is really authentic and genuine. Hi Kalee, I would love love to see Tony Robbins live. He seems to be bigger than life! 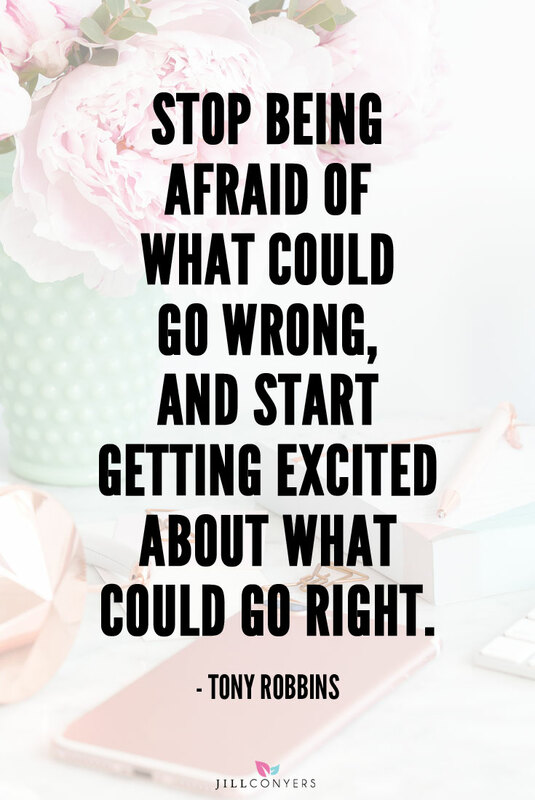 Stop being afraid of what could go wrong – love that. It’s so easy to get fixated on the wrong things! I use that a lot with clients as a psychologist and a personal trainer. Just imagine, all the things that can go right. Congrats on all the growth and positive changes in your life. That’s amazing. Though times like that are also scary as anything. But it is always better to get through them and watch yourself grow. Oh, and I lived in Siesta Key when I was 7 and 8 years old! I loved it, but haven’t been back in forever. Hi Erica, nice to meet you. Siesta Key was wonderful. Honestly, the most beautiful sunsets I’ve ever seen! Except for one very cloudy evening we watched from the beach every night. Our biggest change lately was putting my son in nursery school – two half days, one full day. I was struggling too much trying to work and be present at home, and I felt a constant battle. It was scary to put him in there (especially since people think work at home mom means you can just work with a toddler around – ummm, nope, lol). But it’s already been making me feel WAY more balanced in my life! There are a lot of misconceptions about working from home. The balance feels wonderful doesn’t it. Sincerely happy for your Chrissy. Exhale all the junk! Feels like a weight lifted from your shoulders doesn’t it. I love your attitude! Life demands we keep up or give up… and the right attitude helps us to change and adapt and keep dreaming, instead of just giving up and missing what might have been, or what used to be. I love this. If you are at all interested, I’d love for you to share this with my little community at our weekly link up on Thursday- Encouraging Hearts & Home – you can just stop by my link on Thursday or Friday and share! I’d love to see you there. Hi Marissa. I love the energy of your comment. Thank you. Hi Channing. I do the same thing! A little motivation boost at my finger tips. These are all really great quotes! Thanks for the inspiration! :]! LOVE the quotes, heart! You always make me smile, inspired, and ready to take on the world! Thank you Tiffany for your kind words. Have a beautiful day!